Do you ever feel as a working mom that sometimes you run your week and other times the week runs you? “Mom” is a wonderfully challenging job in itself and when you toss a 9-5 in with it, it becomes even more wonderfully challenging! These 7 productivity tips for working moms help set us up for a smoother week. My work week definitely runs more smoothly when I am intentional about doing certain tasks or having things in order. I do not believe in “having it all together, all the time” for the simple fact that life throws us unexpected situations every single day. But there are habits we can work on to not feel like we are constantly spinning our wheels or just in survival mode. Dump everything onto your master calendar, no matter how small, so that you can plan-and be thinking- ahead. You could even take it a step further and set alarms on your phone for certain tasks or sync your phone with your calendar. This way things won’t sneak up on you at the last minute and send the day into a tailspin. Routines help keep us focused and productive. One way to establish simple routines with time at home is to think in terms of “blocks of time.” For our evening routine, blocks of time (typically) are playing outside, supper, down time (1-2 kid t.v. shows), bath, tidying up, reading and bedtime routine. We’re not super detailed with our evenings because sometimes we grab take out, sometimes there is no bath, etc. but I do know I’m much more productive when I think in terms of blocks of time at home and stick to routines. Focus on most important tasks at home by asking “what absolutely has to be done to keep our home running smoothly?” Then put systems in place to make sure those things are done. Most likely that includes laundry, meals, kid’s homework/papers, essential cleaning, etc. There are a three months during the year when I pay someone to help with some of those tasks. Those are months when my work always requires overtime and I come home drained. It’s the best use of my money because I know I won’t have the time and coming home to those things already done is worth the cost. Prioritizing is also figuring out what shortcuts you can take and still get the job done. I have a notebook with a checklist for each month. In the past, I’ve used a free calendar print out off of the Internet, but last year I made my own template. I chose to make a template because I wanted something that was interactive and easy to edit/save electronically. You can download a copy in the Resource Library. Many of the things stay the same year to year and this makes it easy to update. I have a ½” binder and it simply has one sheet for each month of the year. On each sheet, are things like birthdays, things that I always cook for certain holidays, reminders when it’s time to replace something or make an appointment, etc. The details pay off in terms of planning ahead and having a go-to place for information for the year. Waking up just an hour earlier lets you ease into the day and not feel like you start the day at full speed. This is a habit that I just formed last year, getting up at 5 a.m. instead of 6 a.m. Not easy for a night owl, but now I understand why so many people talk about the benefits of it. It’s quiet and peaceful. It’s time when I’m not pulled in a million different directions. It’s worth it. Working moms tend to focus on everyone except themselves. The problem is that in order to take care of everything and everyone, you have to remember to take care of yourself too. Easier said than done at times but things like getting exercise, fresh air and keeping regular check-ups become vital to keep up with home and work. You can’t do it all. Sometimes that means saying no in order to keep stress in check. Know your limits. Reward yourself with things that keep your mindset positive. This means different things depending on what inspires you the most, but if you enjoy a warm bath… make time for it, a podcast…listen to it, a book… read it, a t.v. show… watch it! Don’t let guilt creep in for doing things that keep help you keep a positive mindset. Instead, this is doing things that help you give your best at work and home. 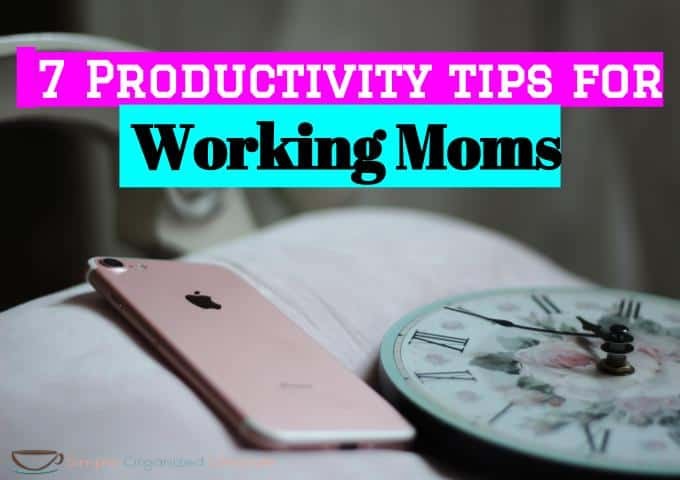 Any other working mom productivity tips that help you keep the week running smoothly? Feel free to share!